MADRID, Spain (CNN) -- Spanish Prime Minister Jose Luis Rodriguez Zapatero reshuffled his cabinet Tuesday, replacing the finance minister and making other changes as the financial crisis deepens in Spain and the conservative opposition shows signs of resurgence. Spanish Prime Minister Jose Luis Rodriguez Zapatero has reshuffled his cabinet. Pedro Solbes, the second deputy prime minister and also the finance minister, was ousted, with Spain's unemployment rate of 14 percent the highest in the European Union and with the first Spanish bank failure announced just 10 days ago. Zapatero announced the shakeup in a nationally-televised statement in Madrid, the first sweeping cabinet changes - after the recent substitution of the justice minister - since his Socialist government was elected to a second four-year term in March 2008. 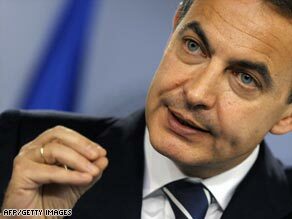 "The fight against the economic crisis is our highest priority and it's in a decisive phase," Zapatero said. "There needs to be a change of rhythm to push ahead, with new strength, in a new period, especially during the first semester of 2010 when Spain will hold the (rotating) presidency of the European Union." The cabinet will now have three deputy prime ministers, one more than at present, and Zapatero shifted some responsibilities from some ministries to others. The main opposition conservative Popular Party, plagued by internal bickering, roared back with strong showings in regional parliamentary elections last month and took aim at the cabinet shuffle, which has been widely rumored in Spain since Sunday. Popular Party president Mariano Rajoy, whom Zapatero defeated in general elections last year, said it was right to change "the crew and mid-level officers," but he said the real problem was "the captain," or Zapatero himself. Outgoing finance minister Solbes, a veteran with deep contacts across Europe, was credited just a year ago with helping Zapatero to win a second term. But Spain's impressive economic growth has nose-dived, as the construction boom has dried up. The Bank of Spain said last Friday that unemployment would exceed 19 percent next year and that Spain's economy would shrink by 3 percent this year, nearly twice the government's 1.6 percent forecast. Replacing Solbes will be Elena Salgado, an economist who leaves her post as minister in charge of relations with Spain's 17 regional governments. Before that, she was minister of health. The cabinet shuffle brings a veteran Socialist leader, Manuel Chaves, back to Madrid as the third deputy prime minister, focusing on relations with the regional governments and regional nationalist parties. He has been president of the Andalusia regional government in southern Spain, considered a Socialist fiefdom at the polls. The Socialist Party's number two, Jose Blanco, becomes minister of development, replacing Magdalena Alvarez, who was criticized for her handling of highway snow blockages, the fatal commercial jet airliner crash in Madrid last August and delays in construction of the high-speed train linking Madrid and Barcelona. Three other ministers - of education, health and culture - were sacked, to be replaced by Angel Gabilondo, Trinidad Jimenez, and Angeles Gonzalez Sinde, respectively. Zapatero - just back in Madrid from trips to the G20, NATO, European Union and Alliance of Civilizations summits, where he had his first meeting with U.S. President Barack Obama - informed Spain's King Juan Carlos of the cabinet changes on Tuesday morning. The new cabinet will be sworn in later Tuesday in time for a Cabinet meeting on Wednesday, just before Spain's Easter weekend break that begins on Thursday, Zapatero told a news conference.